Rye, a residential suburb and beach resort, is on the Mornington Peninsula, 65 km south of Melbourne. Rye's commercial centre overlooks Port Phillip Bay, but the locality runs southwards across the peninsula to the Rye back beach on Bass Strait. Rye and adjacent areas were settled as the Kangerong pastoral run (1837), which was renamed the Tootgarook run. Tootgarook generally described the area occupied by Rye, and it was not until 1884 that the old name was completely displaced by 'Rye'. It is thought that the inspiration for the name was Rye in Suffolk, England, first given to the Rye Hotel (1850s). Much of the Mornington Peninsula between Sorrento and Dromana is limestone overlain by sand and recent deposition. Sorrento was mined for building lime for the Melbourne building trade and the upsurge in building activity in the mid-1850s after the rushes led to Tootgarook's limestone being exploited. So too was much of the local banksia, sheoak and tea tree for limeburning, leading to extensive invasion of the bare land by tea tree. That in turn led to tea tree cutting for bakers' ovens over most of the nineteenth century. The limeburning, timber-cutting and fishing settlement required the opening of a school (1855) in an Anglican church, the building of a jetty (1860) and the opening of the Tootgarook Inn in addition to the Rye Hotel (both 1850s). Further changes to the landscape occurred in the 1870s when most of the dozen local lime kilns were acquired by a Melbourne firm and lime burning concentrated in one large kiln, joined to the pier by a tramway. The pier, however, was not used by the bay steamers for holidays and excursions (like Sorrento and Mornington), and Rye remained a rural community. Inland, the sandy dunes were invaded by rabbits, changing the park-like 'cups', described as inexpressibly elegant by Lieutenant James Murray in 1803, to a wasteland. A far-sighted visitor, J.L. Brown, thought that if the wasteland could grow tea tree it could be sown down to pasture behind wire netting, and this was gradually done after 1910. During the 1920s-30s Rye's population increased to about 3000 people and motorised transport brought it more easily in touch with metropolitan holiday-makers. A sports ground, the Rowley reserve, was laid out (1922) and a golf course was established south of the foreshore shops. 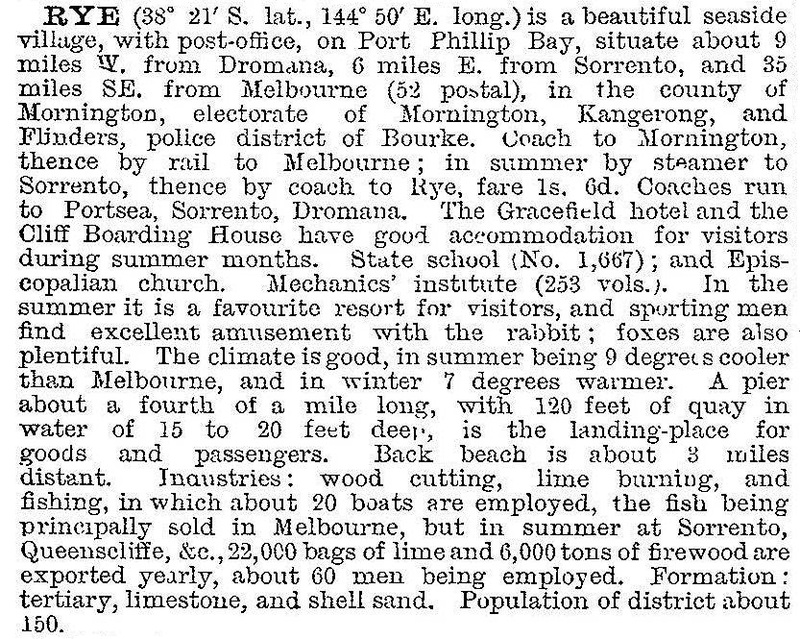 In 1949 Broadbent's guide to Mornington Peninsula stated that Rye was at last developing into a popular seaside resort. Its tree-lined foreshore had sheltered spots for picnic parties and facilities for campers. There were furnished flats, a caravan park and hotel and guesthouse facilities. The Whitecliffs Lodge and Whitecliffs store and kiosk recalled the prominent limestone bluff on Port Phillip Bay. During the 1950s-60s Rye became suburbanised as housing was extended southwards into the peninsula and later reaching the back beach. The loss of the golf course to housing was not rectified until 1993 when the Limestone Valley Golf and Country Club was opened. Rye has front and back beach foreshore reserves, with camping on the former. There are two caravan parks and several holiday units. Outnumbering these are the many holiday houses for Melburnites. The bay beach has large areas of safe, shallow water. Rye's shopping centre has a large supermarket, and there are a public hall, a bowls club, a yacht club and Catholic and Presbyterian churches. There are monthly Saturday community markets and a Summer foreshore beach carnival. Rye primary school had 420 pupils in 2014.